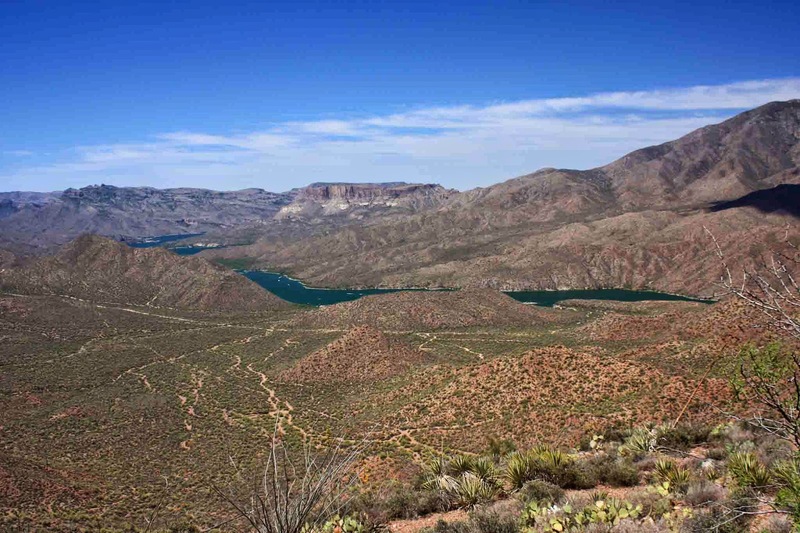 One of the few bright spots I took away from my AZT #19 outing was recalling the Tonto National Monument perched high above Roosevelt Lake. 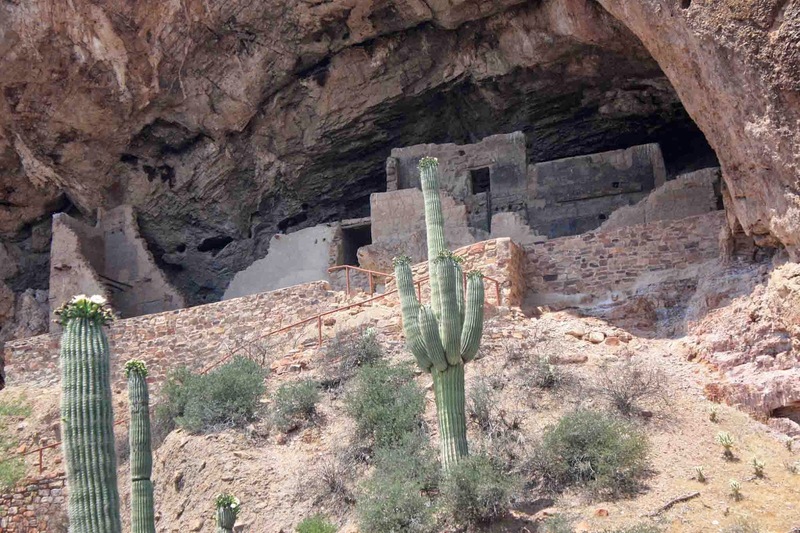 Both cliff dwellings were visible from the road as I drove in last Saturday. 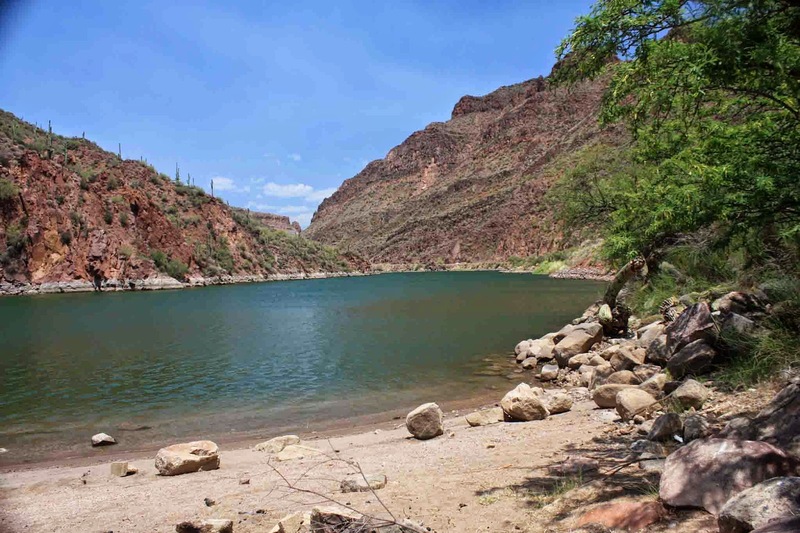 I thought it would be a good time to make a return visit with K, spend a lazy day exploring the ruins, hanging by Apache Lake then stopping for ice cream in Tortilla Flat. 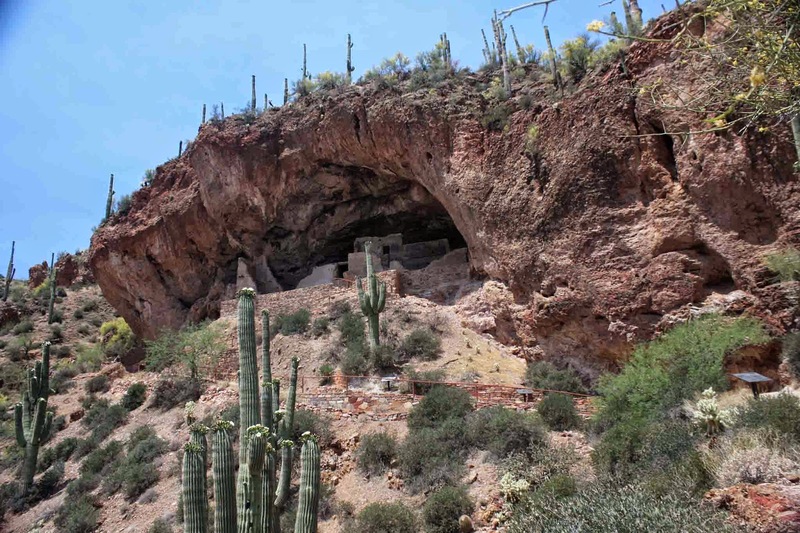 Lower & Upper cliff dwellings from AZ188. 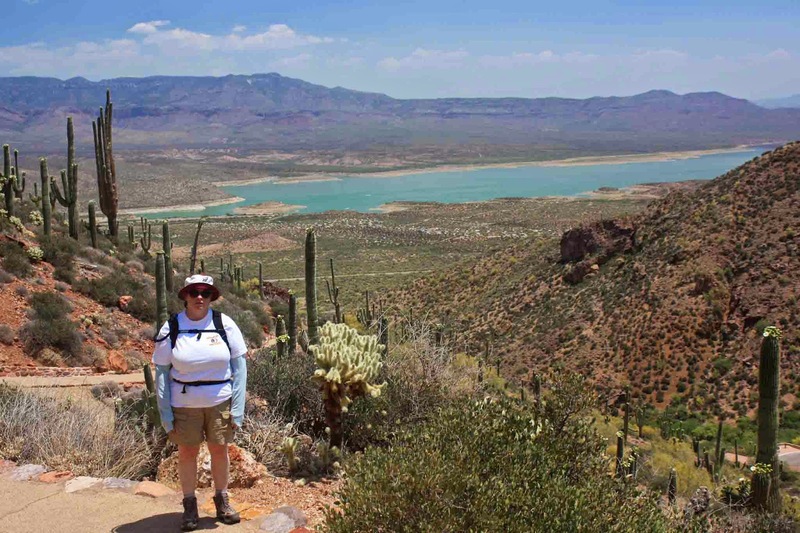 We took the longer, albeit the same time-wise, paved route to Tonto Nat'l Monument. 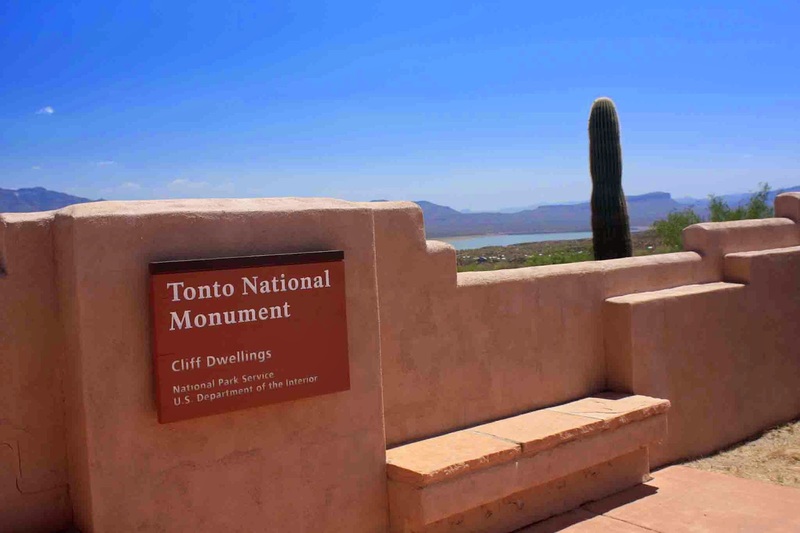 We were inside the visitor center when we were informed that guided tours to the upper dwelling were no longer being offered as the heat had now driven most tourists away. It was also when we learned that the lower dwelling was inaccessible due to bees!! Drat. I guess I should have taken a gander at the park website before making the trek, but it was still a nice drive and a beautiful desert day. So, we forked over our park fee and walked up the trail to the closest viewing area of the dwelling. Still quite impressive. 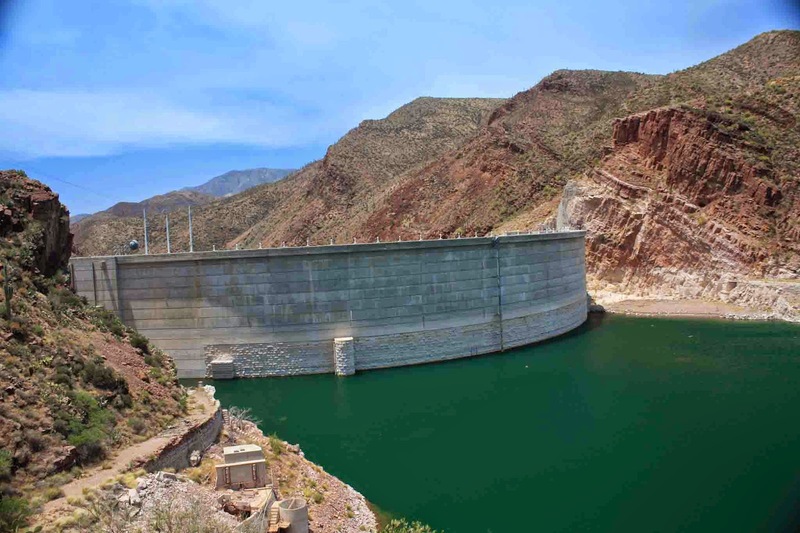 Roosevelt Lake just over the wall. 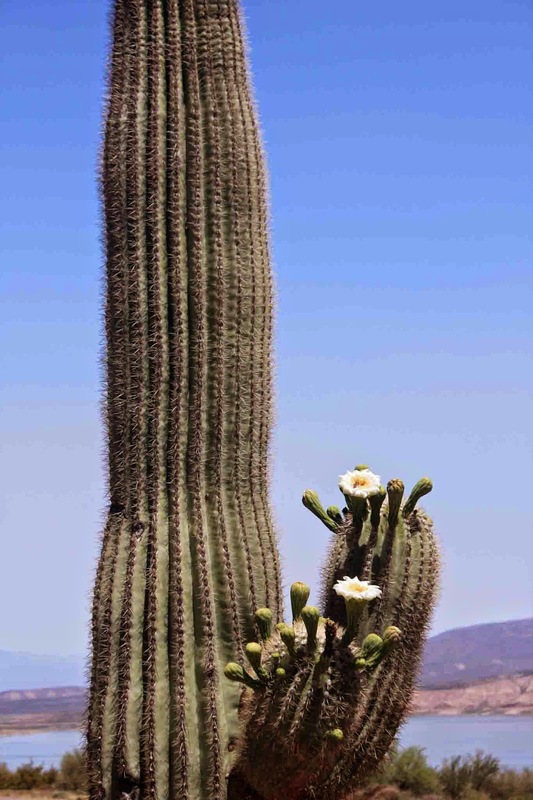 Saguaros are one of the last blooms before the intense summer heat. As close as we could get, when bees aren't present you can walk inside the dwelling. 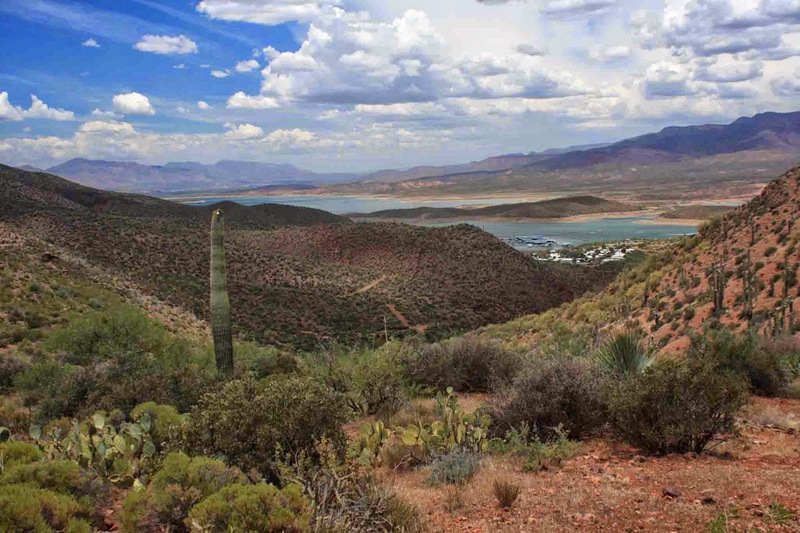 K and I were treated to sprawling views of Roosevelt Lake. 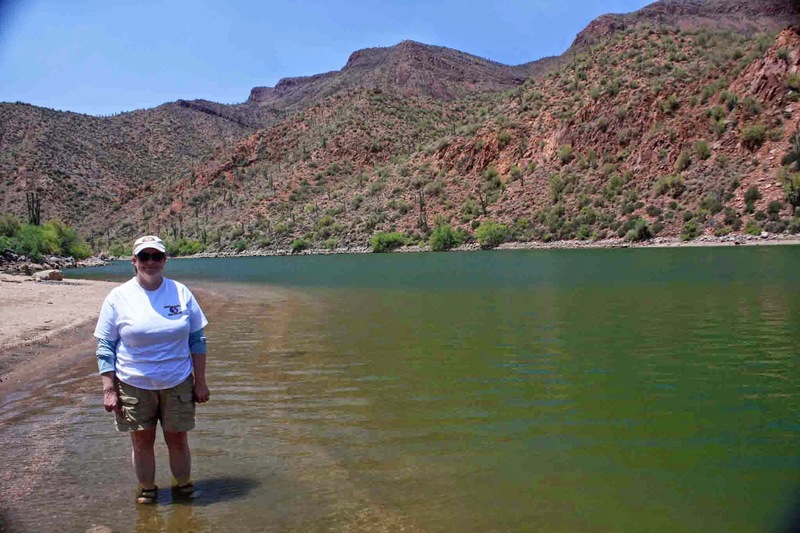 We left the monument with our sights set on a picnic lunch in the sand by Apache Lake. I spotted a small pullout a week earlier when I rode by on my bike. The spot was clear and we made our way down to the cool waters edge. 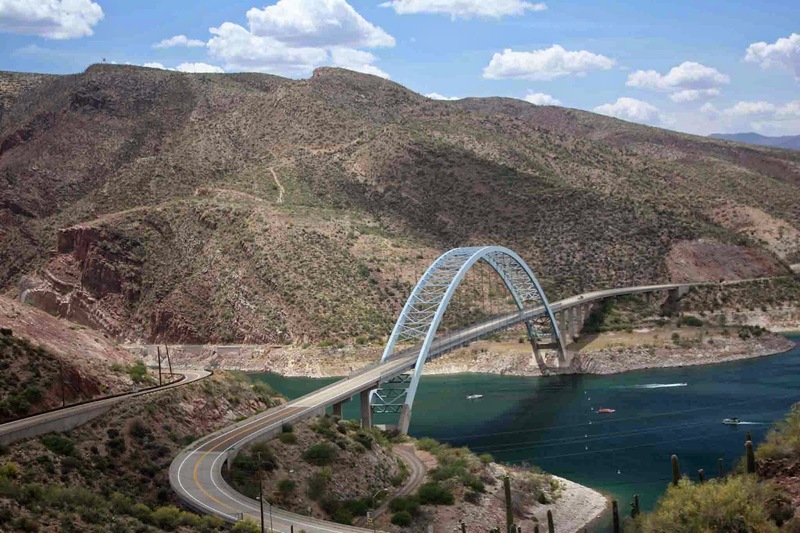 Roosevelt Bridge is quite a sight. 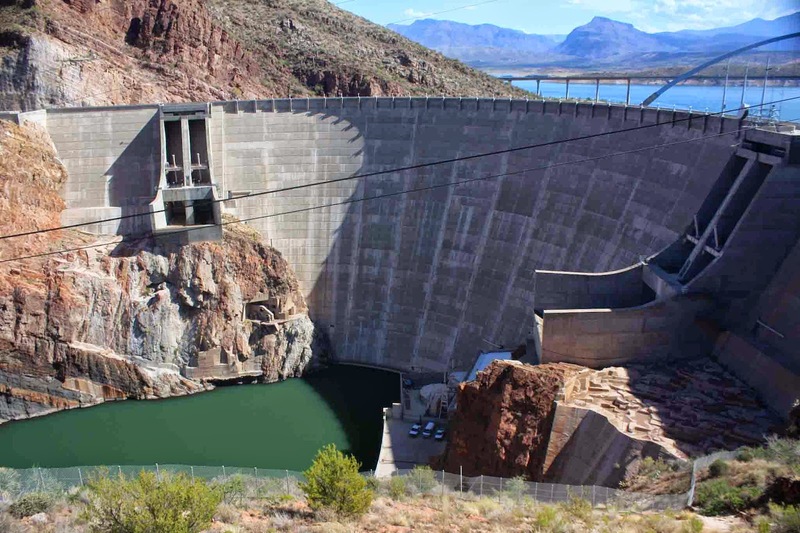 Downstream side of Roosevelt Dam. View from our lunch spot. Felt good to soak the tootsies. There was even a bit of shade. 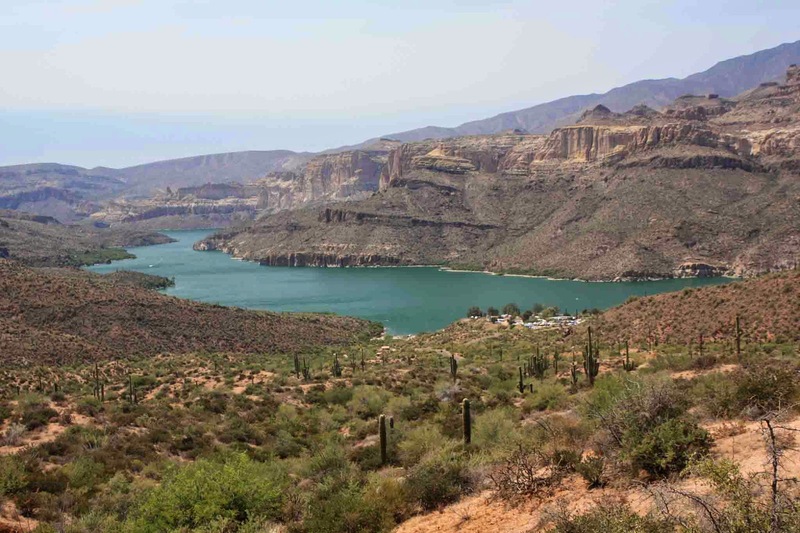 Apache Lake overlook from the Apache Trail. 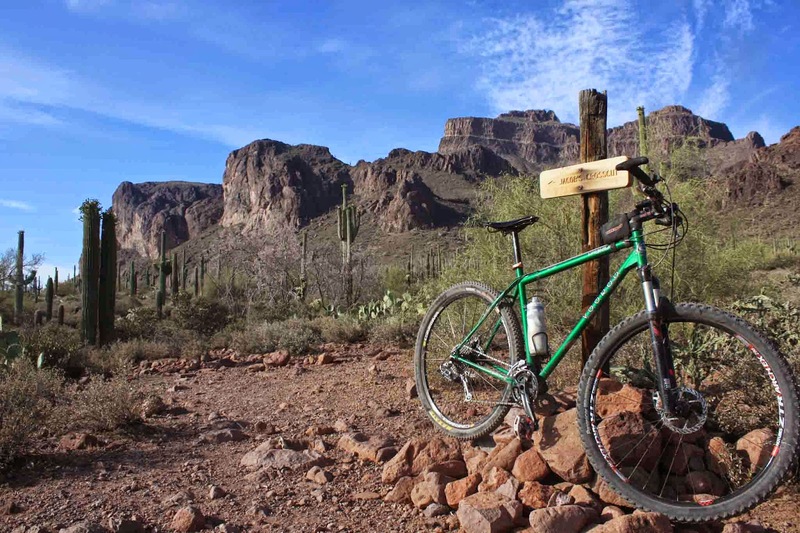 The drive on the Apache Trail dirt road is one of the more scenic, yet accessible routes from the big city. 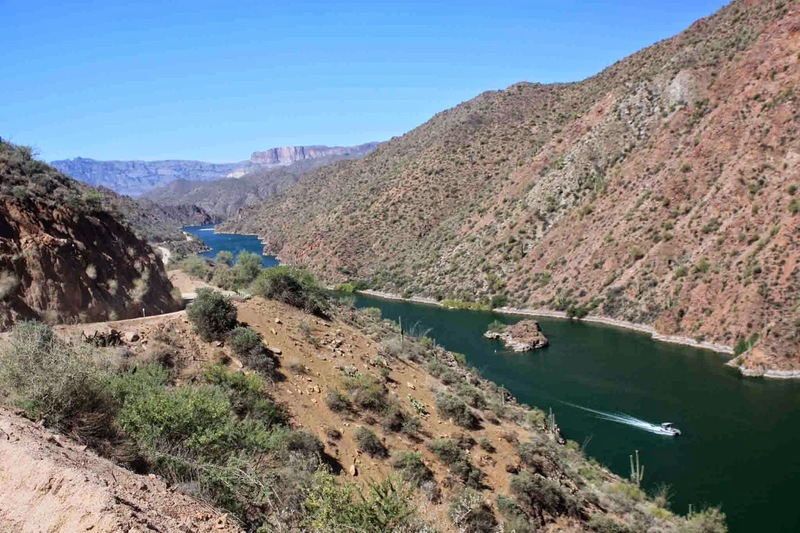 It also doesn't hurt that the small 'town' of Tortilla Flat is nestled among the rugged mountains offering tourists a sampling of the wild west. I think the population is listed at 6 full-time residents, but there's a nice saloon to grab some burgers and next door some much anticipated ice cream!! It was a great little getaway for the day. 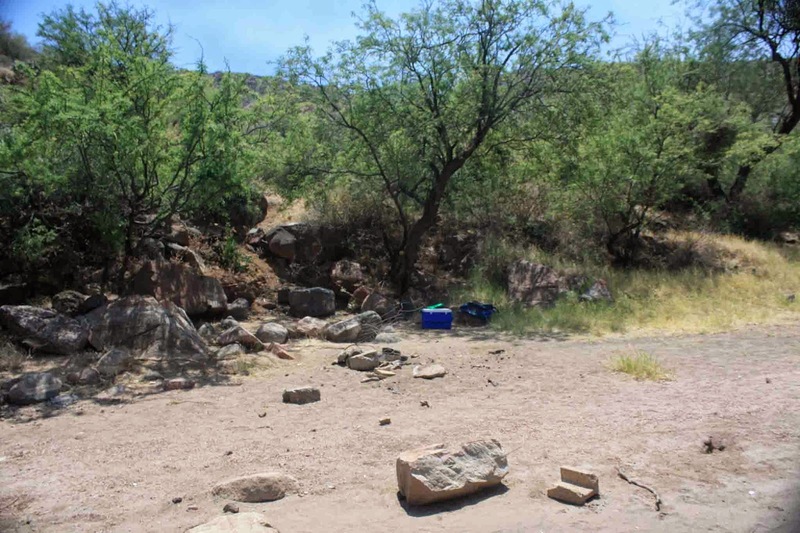 It was concluded on this outing that we need to make more of an effort to leave Phoenix for day trips or weekenders throughout the summer. It helps to pass the time a bit quicker as the dogs days of summer approach. 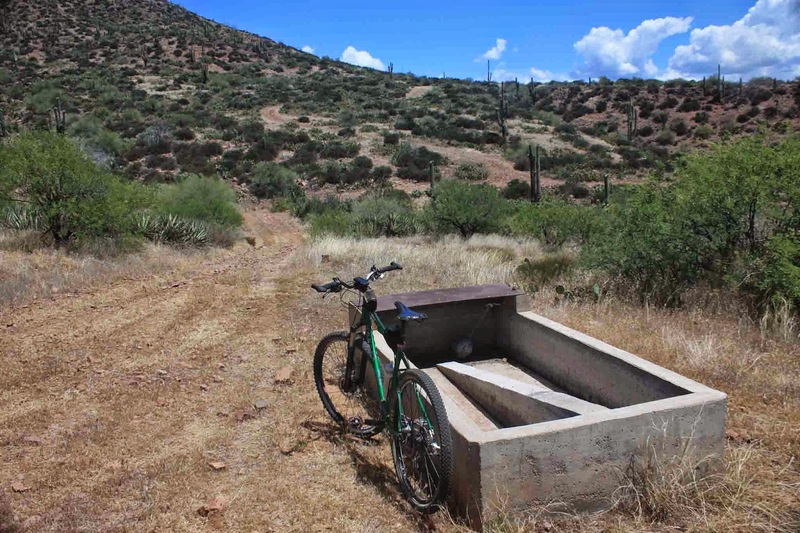 Ever since Jeff, Nancy & I rode Passage #20 of the Arizona Trail I've been clamoring for a chance to check out Passage #19. They're neighbors after all, separated by a desert river. 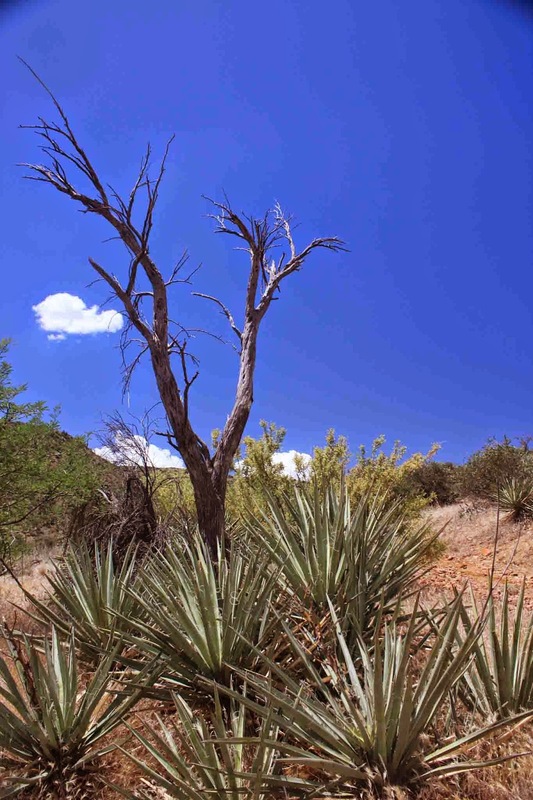 I had high hopes, but tempered them due to the nature of the AZT. Trail beta was hard to come by as well. 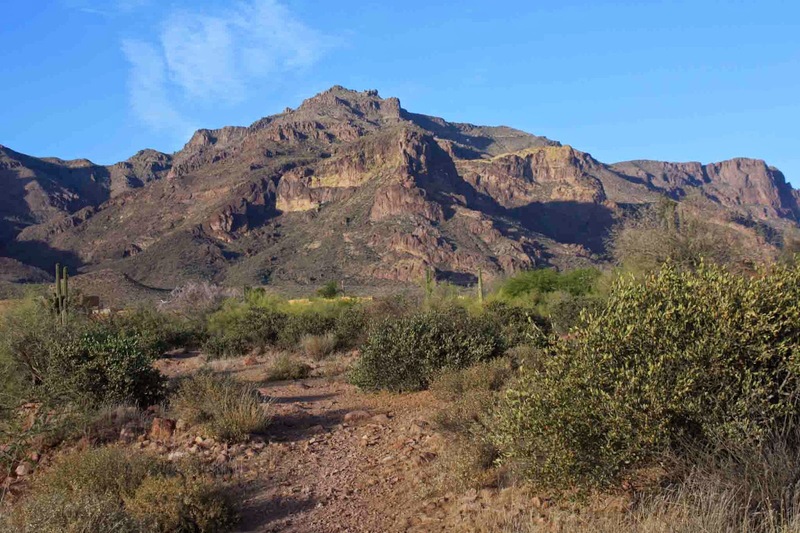 I put together a route that would be a loop with an out-n-back up to the Wilderness boundary in the Superstitions. Another reason for this scouting trip was to see if a viable alternate route existed for inclusion in the AZTR750. 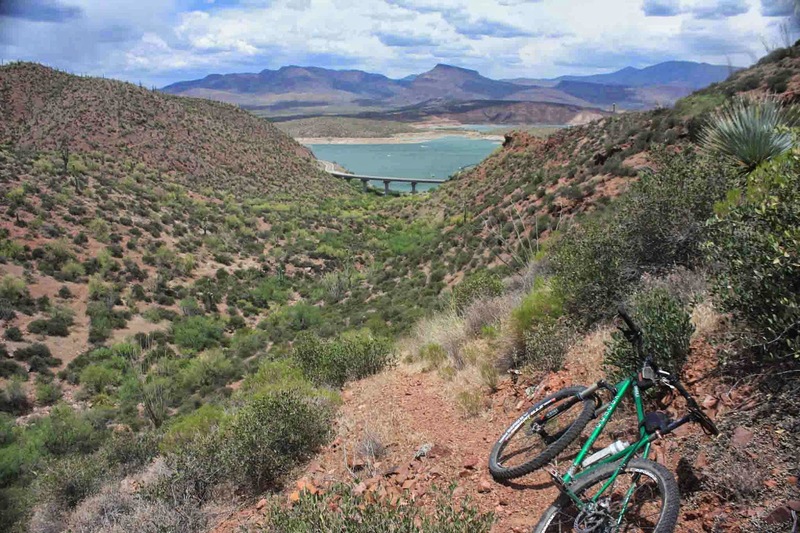 The central AZ portion of the route has a ton of road miles, both paved & dirt, to avoid the numerous Wilderness areas. 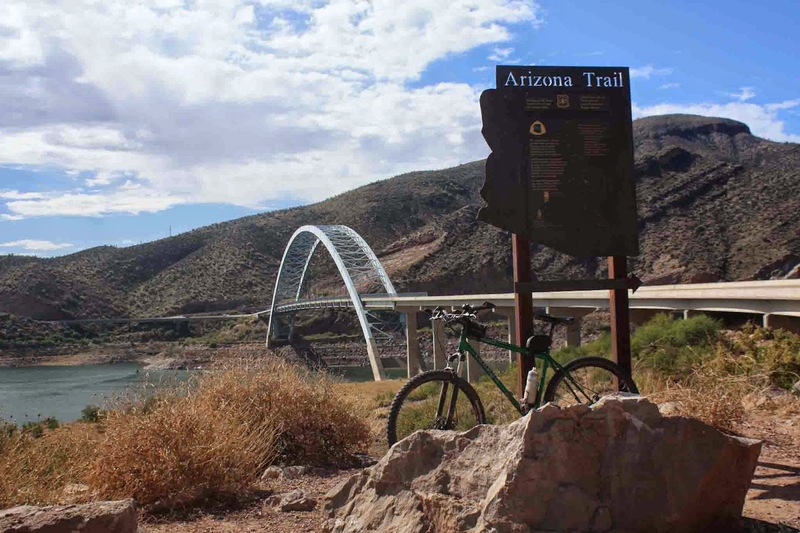 So, adding some of the AZT would be a good thing, right? 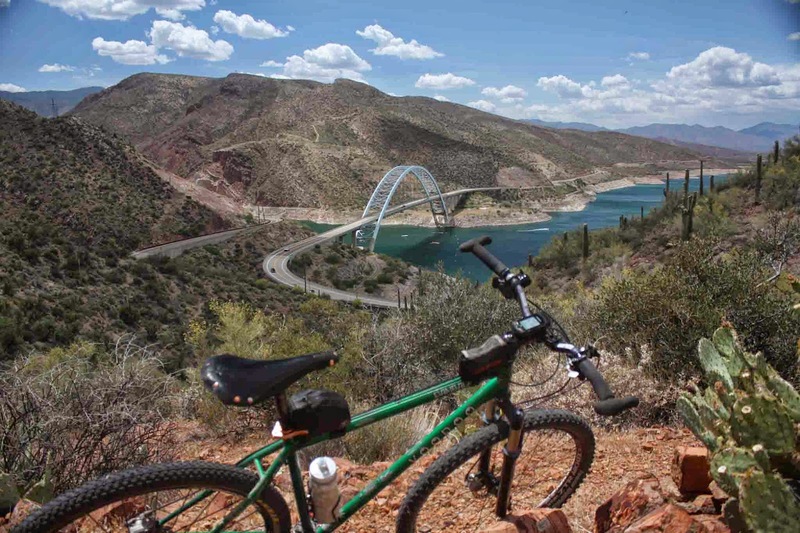 A few of us tried to do this route a week earlier, but at the eleventh hour my bike had other ideas. This go-round left me with no riding partners, a solo adventure into 'uncharted' territory - how cool!! I slept in a bit longer than I would have liked, but I needed the rest. 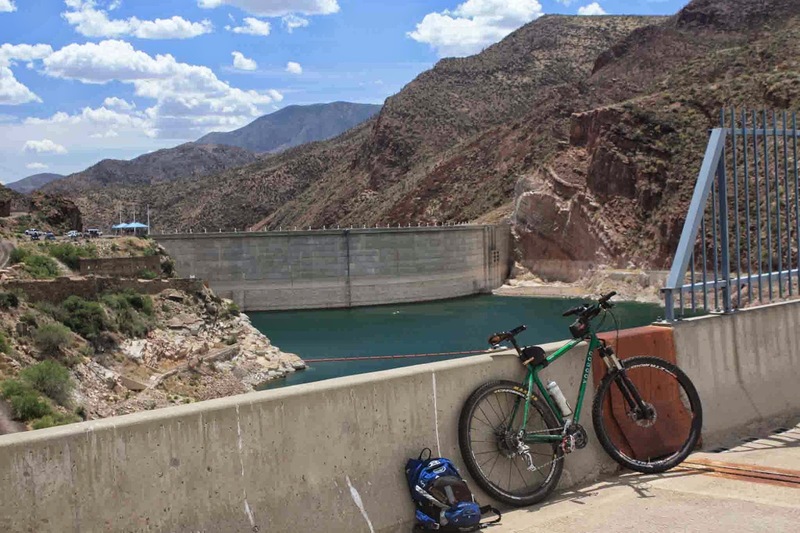 I arrived at Roosevelt Lake and was pedaling across the bridge around 9am. 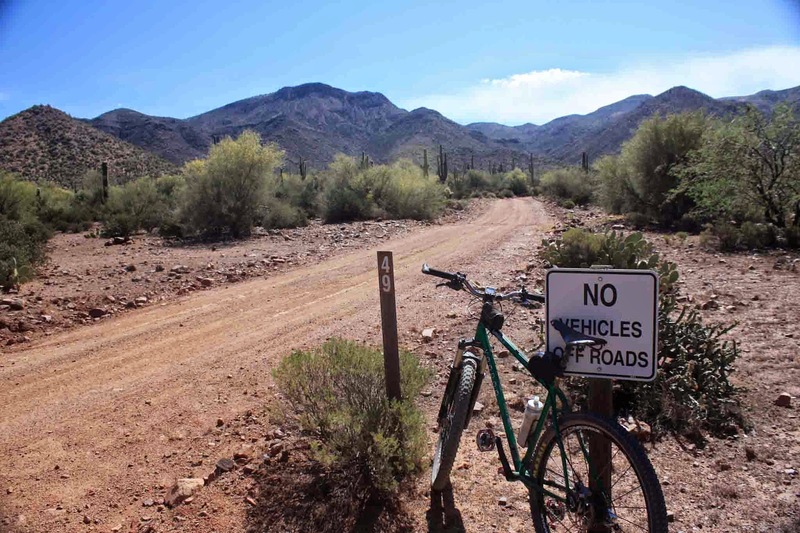 The first order of business was a 6+ mile stretch along the Apache Trail, not much of a trail, rather a graded/washboarded dirt road. 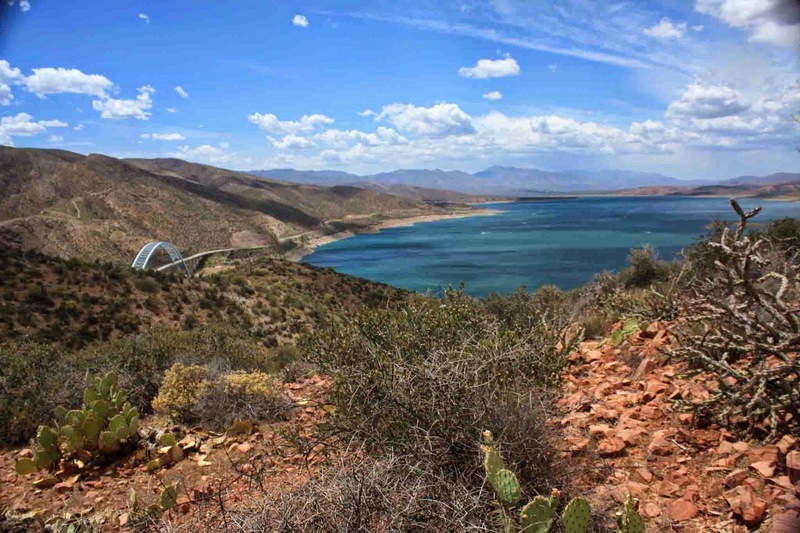 It's quite an impressive area, rugged mountains & canyons all around leading down to the azure waters of the Salt River as it turns into Apache Lake. Roadside pullout marking the transition from Passage 19 to 20. 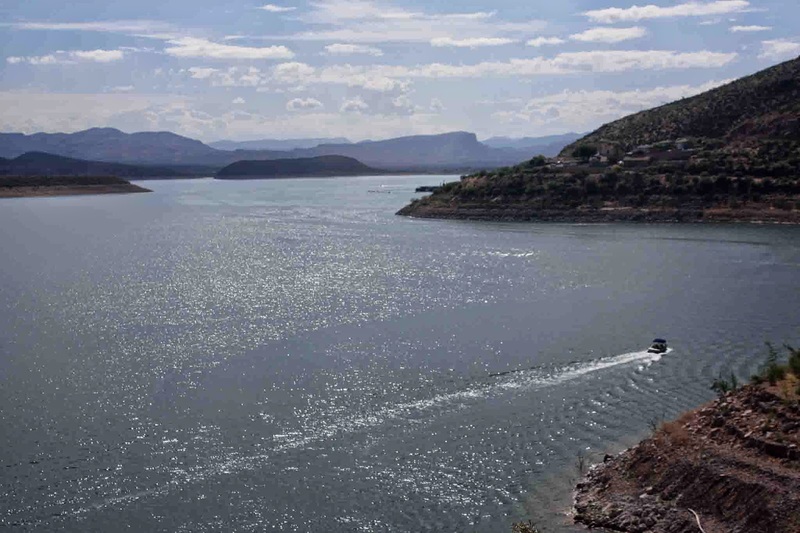 Not many boats on Roosevelt Lake in the early hours. My view for 6+ miles, not bad, eh? My later start also meant there would be a bit more traffic on AZ88 stirring up dust on this holiday weekend. It wasn't too bad except it always seemed a vehicle would pass me while I was trying to fill my lungs with air on a climb!! AZ88 is anything but flat, undulating over a couple decent climbs before my split onto FR49. Snack break & on to the road less traveled. As the above pic clearly shows, FR49 starts off really nice. The grade is gradual as the mountains approach, but the sand intensifies not to the point of walking, but enough to let you know it's there. About 1 mile later there's practically a line drawn in the sand boldly challenging any rider to cross. 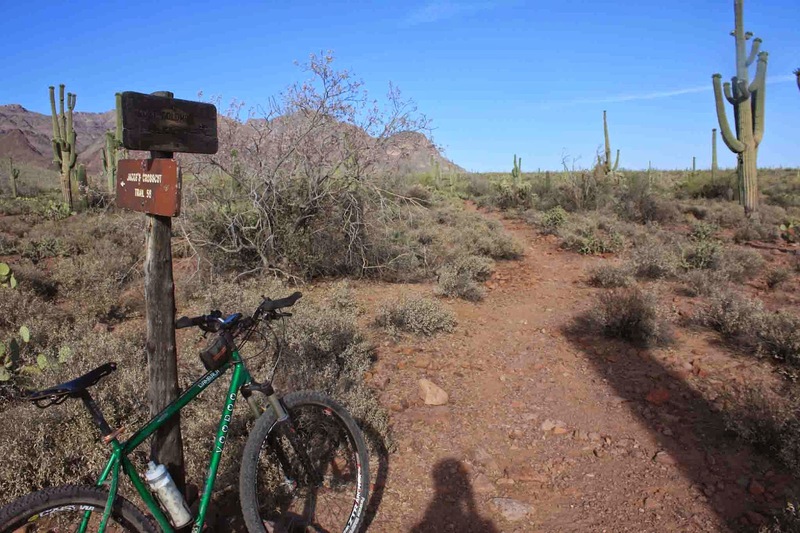 Of course I crossed it, I'm a dumb mountain biker who likes a good adventure!! Let the hike-a-bike, HAB, commence!! I didn't last very long trying to ride up this, even in HAB mode it was tough going. The only people I saw all day, 3 ATV'ers coming down where I need to go. Gaining elevation rapidly, well as fast as I could walk anyway. 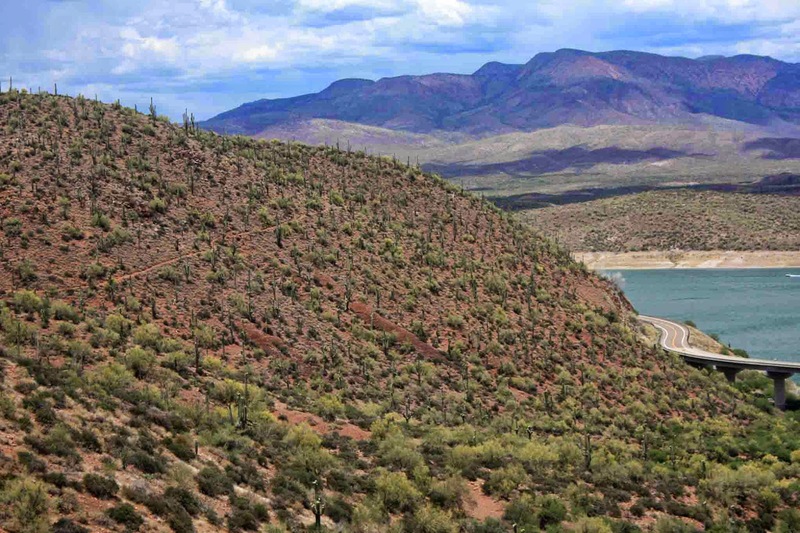 Apache Lake, AZ88 & FR49 snaking through the desert. 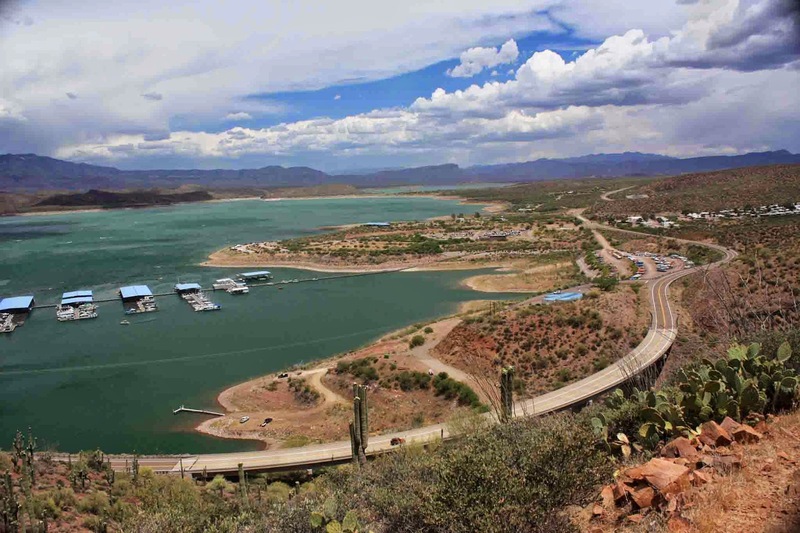 My first peek at Roosevelt Lake from high above. 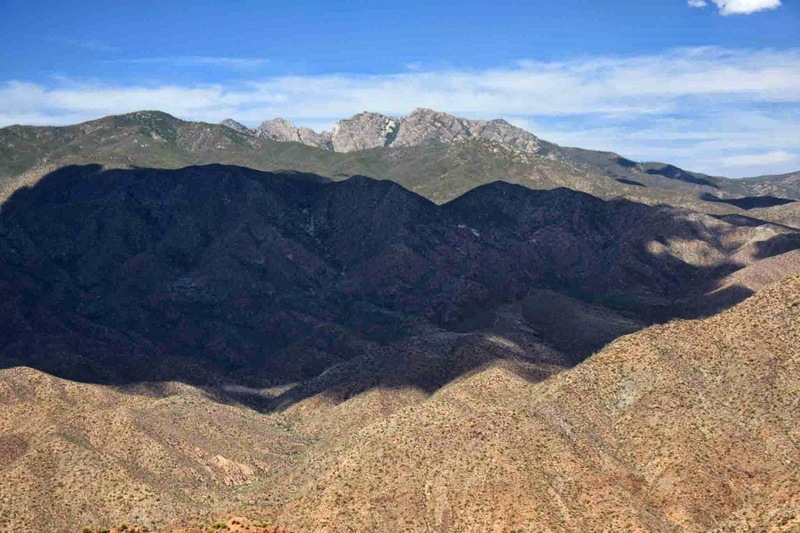 Four Peaks don't look as impressive from this angle. The beginning of a long rubbly descent, I washed out once on this downhill. 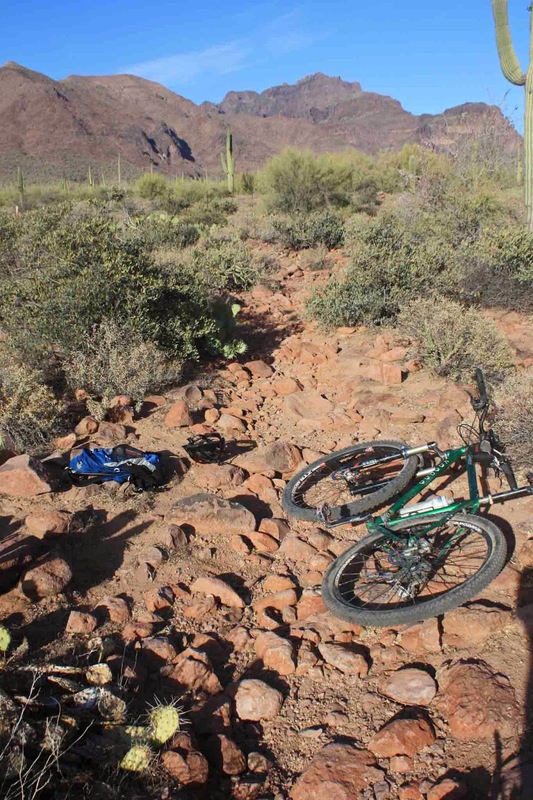 Down, down, down, making my brake pads smoke as I near the AZT. Third trough I passed, nary a drop. Giant wishbone...I wish for some rideable singletrack!! 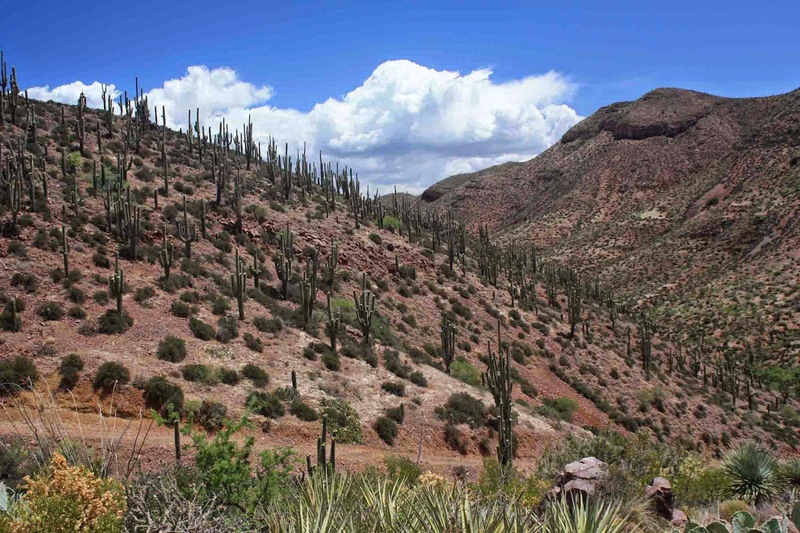 The final rock-surfing descent to the AZT had this cool Saguaro forest covering the hillside. 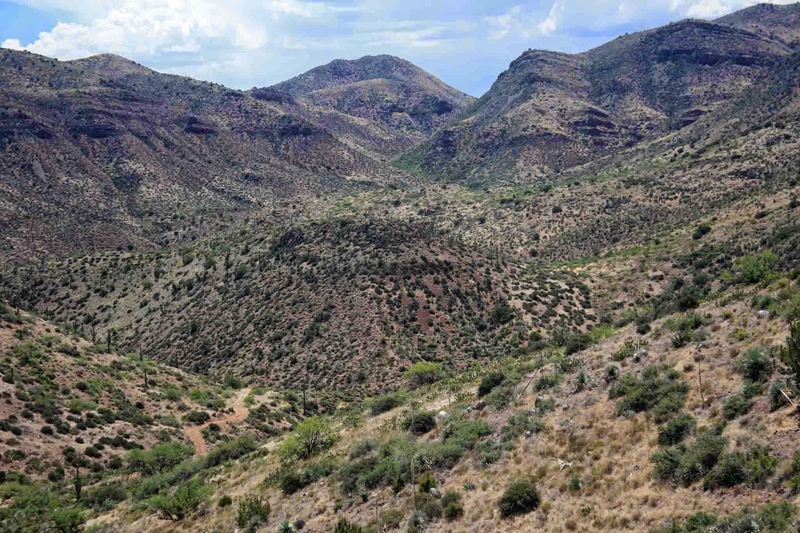 The jeep road shitshow finally leveled out as I rendezvoused with the AZT at Cottonwood Creek. 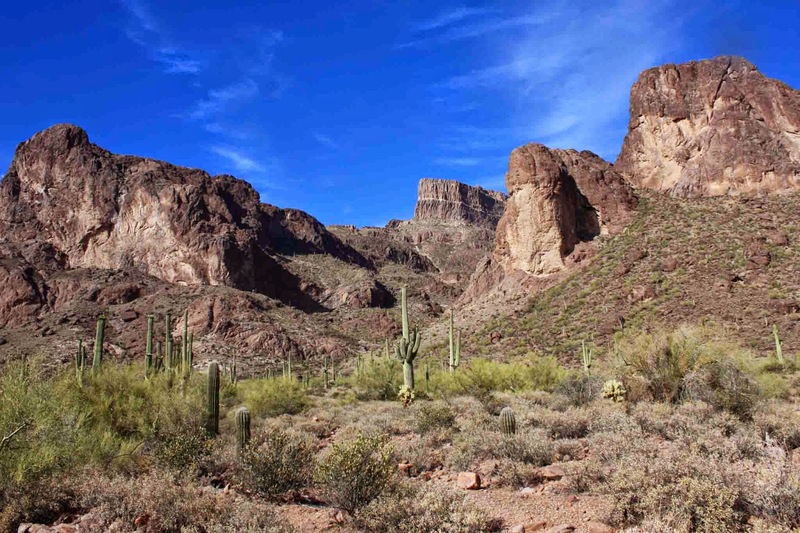 As is typical in Arizona, just because it says creek on the map doesn't mean there's water in it!! Cottonwood Creek was no exception, dry as a bone. 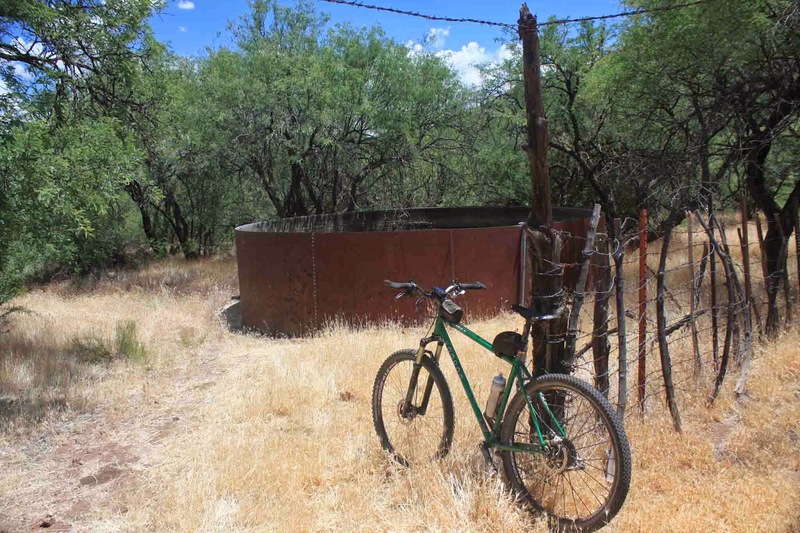 However, there was water in the metal tank where I met the trail. 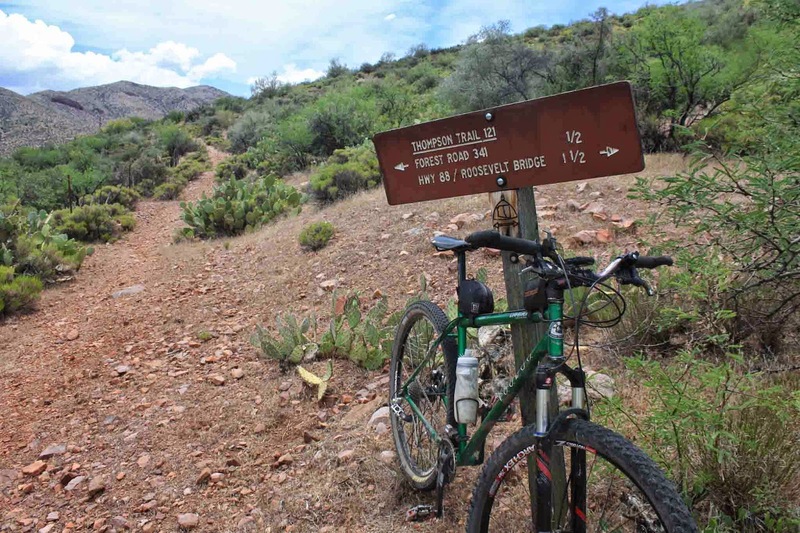 By now I had given up on my plans to ride up the AZT for 4 miles to the Wilderness boundary. 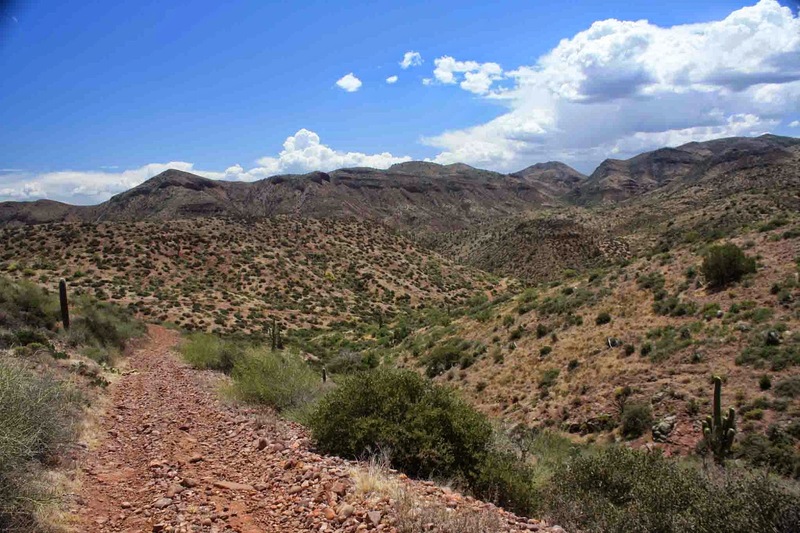 The few reports I obtained of the area indicated the tough nature of the trail through this area. I did wander up the trail on foot to see what it looked like. 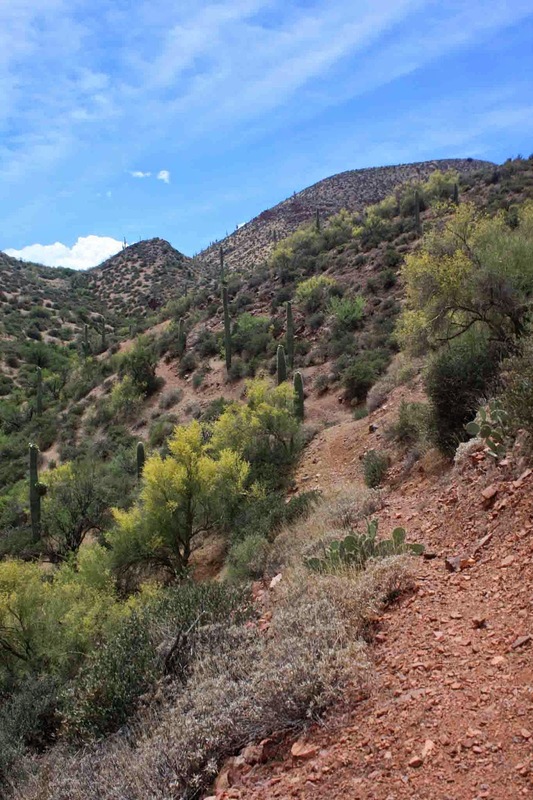 It was overgrown with catclaw in places and the trail had some boulder obstacles to overcome. I was content with my decision to cut the ride a bit short in hopes the lower section would turn out much better than my jeep road approach. I decided to not venture south from here. Nice little oasis in the backcountry. 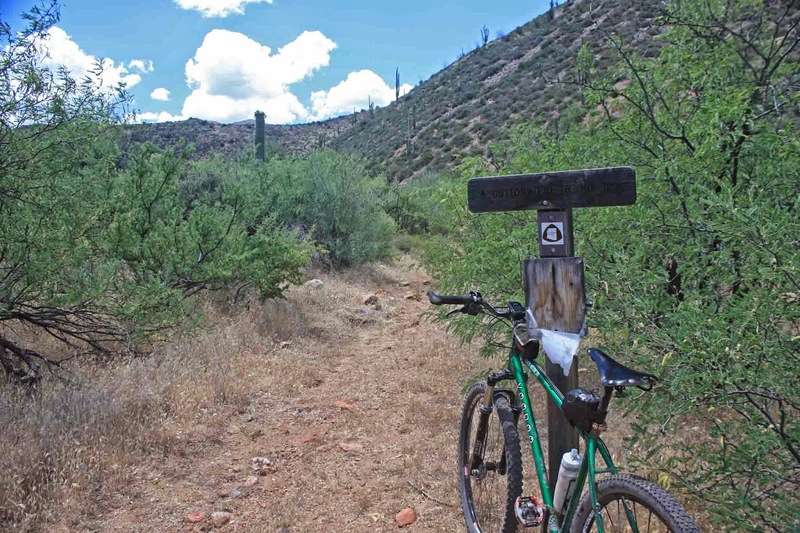 After a quick snack I was heading north on the AZT....on jeep roads once again. They were a bit more manageable in the beginning, but soon they too pointed sharply downhill. For the third time on this ride I laid the bike down when my front tire drifted sideways trying to stay on a line through the chunder. It was hard walking down some of the pitches, I dodged a few turned ankles for sure. 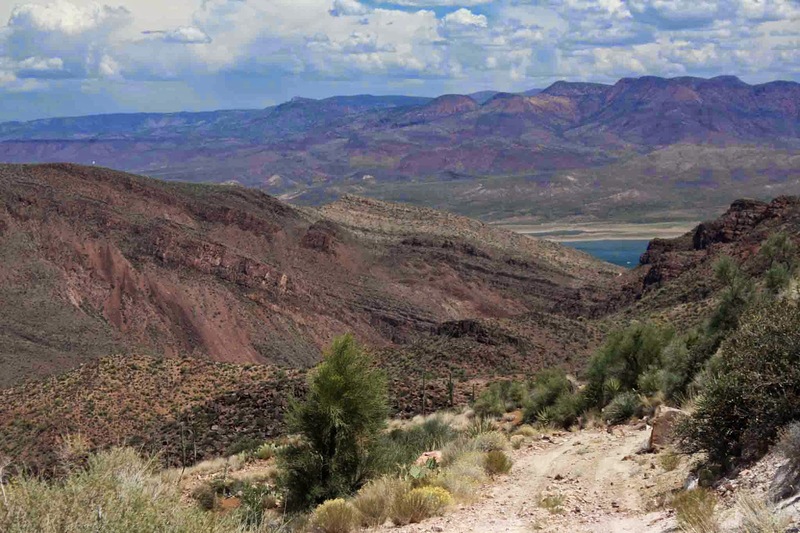 The start of a few up & downs near Roosevelt Lake. Finally!! I get to ride singletrack. I only had a few miles to go and I was about to ride singletrack for the first time today!! It started out good and I began thinking how people could ride passage #20 then come over to #19 and at least make a short loop that included this singletrack. 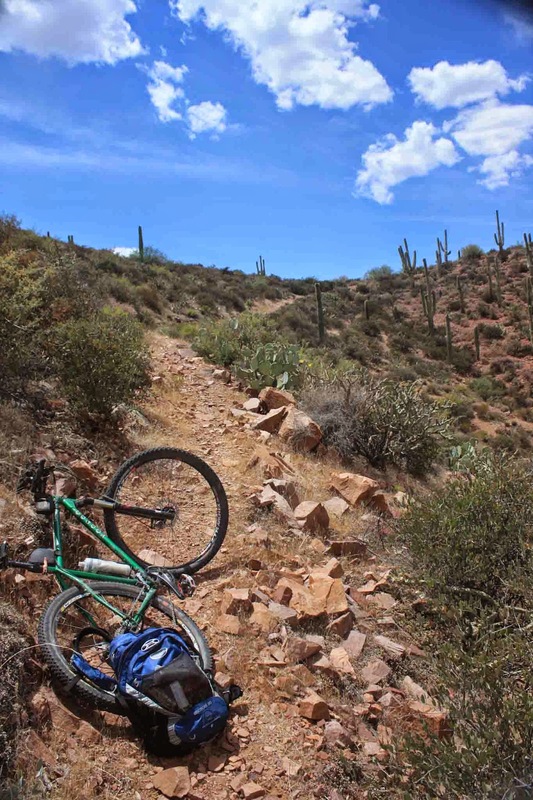 My plans were dashed quickly as the trail surface deteriorated and the grade became too steep to ride. More HAB please. The only bailout along the singletrack piece. Off camber, steep, loose & narrow in spots had me walking a lot. A rare treat here, a nice climb! It was short-lived yet again due to steepness. This photo turned out cool, as the curve of the road gives in an almost fisheye feel. 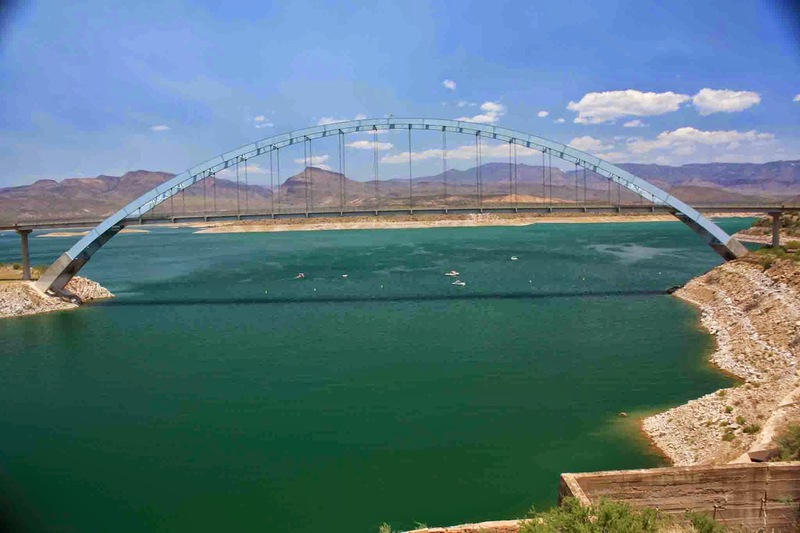 First sighting of Roosevelt Bridge and the finish. Beautiful overlook at the top of the final descent. 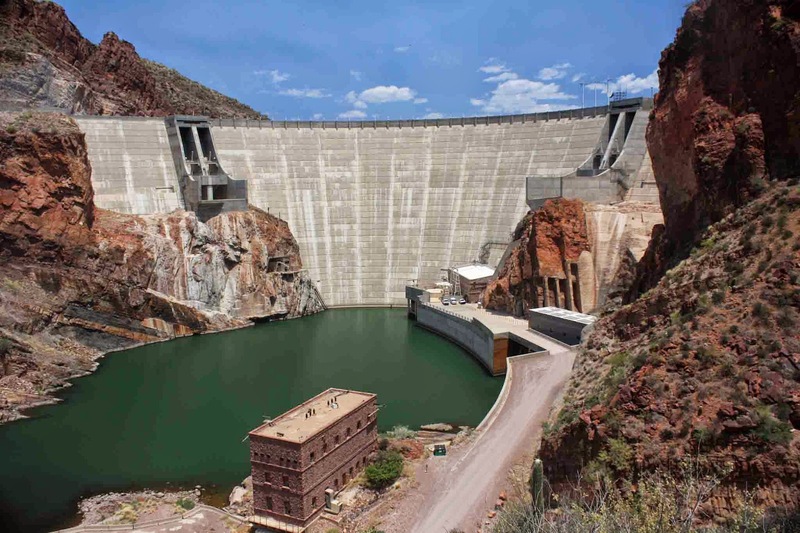 A truly magnificent structure. Passage #20 winds down the far ridge and the microwave reflector can be seen on the upper left ridgeline. 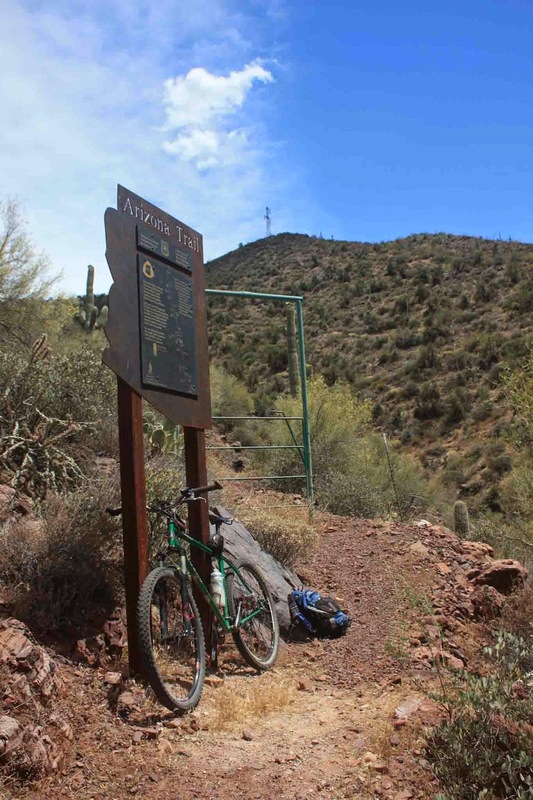 AZT sign marking the end of the dirt trail for passage #19. 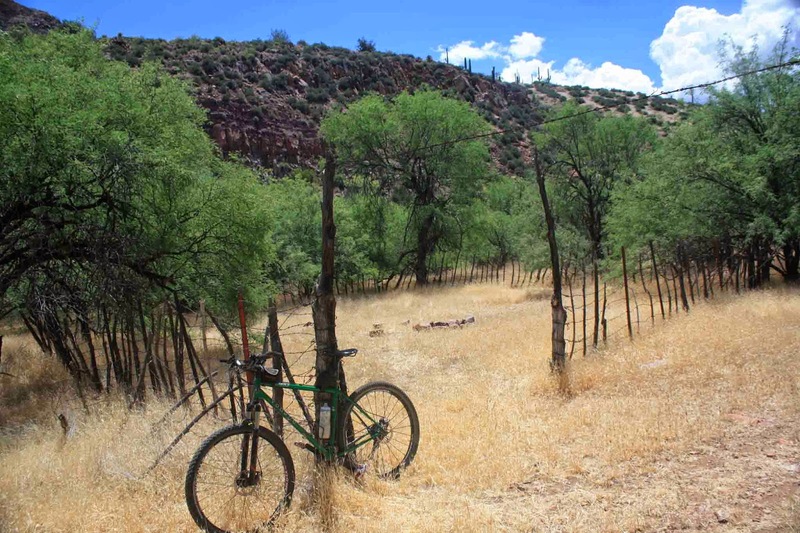 Last time I was riding the Jacob Crosscut trail, Larry and I were bikepacking the Salty-Gila Tour and I was pleasantly surprised to see some trail work had been done. 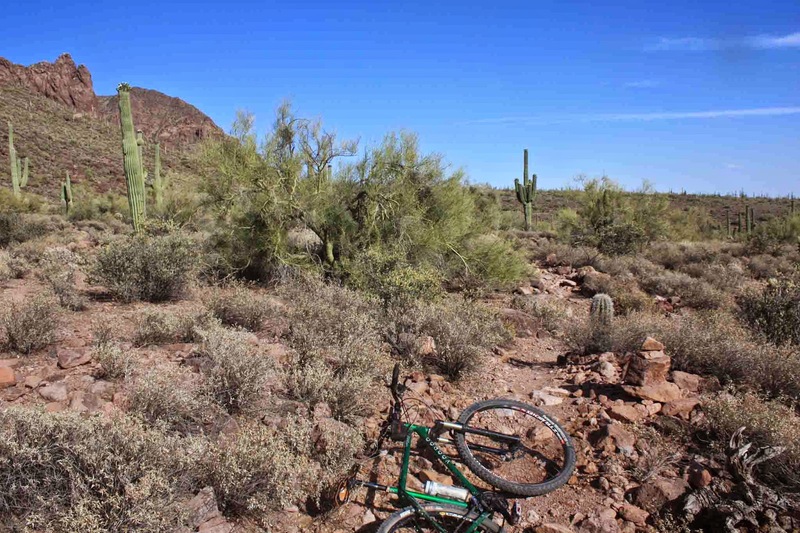 I wasn't sold on the entire trail being rideable that day, so we stuck to the route & bailed to the neighborhood. Of course this piqued my interest and I finally found the time to head back out to check on rest of the trail. I figured while I was at it I'd also pay the West Lost Goldmine another visit as well. Would these trails finally be worthy for inclusion into bigger routes? I hoped so. 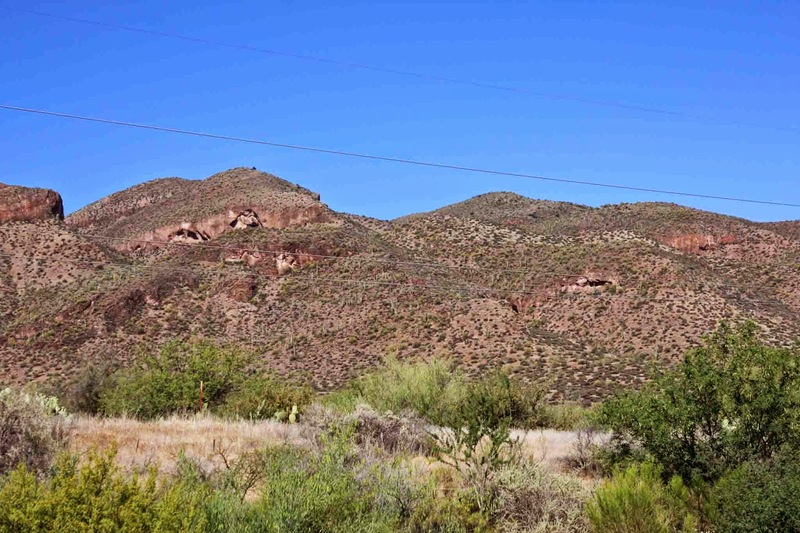 I started my loop in Gold Canyon near the De La Cruz Mexican Gille and immediately spotted a 2-track heading west a bit farther from US60 than the dirt frontage road. This worked out nicely as the 2-track then presented me with an option to take a short singletrack climb on the flank of Silly Mountain. The very top had some rubble, but it was good otherwise. 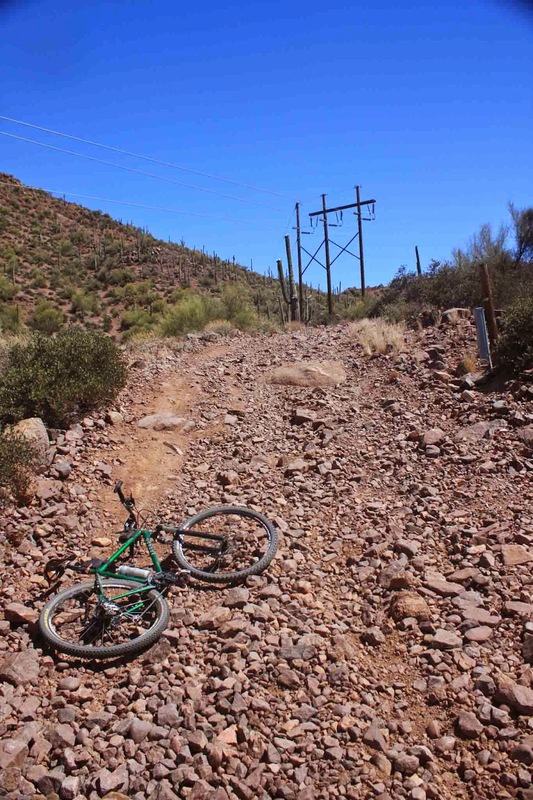 I then dumped onto the paved neighborhood roads of Apache Junction, where they typically dead-end into dirt connectors. A few zig-zags and I was at the start of the bailout trail, not sure how rideable it would be in the uphill direction. Again I was surprised to find the trail very rideable, only the last 100 feet or so had an overabundance of loose chunk on the trail. I was now at the Jacob Crosscut trail ready to continue south. Start of the Jacob Crosscut trail for this day. 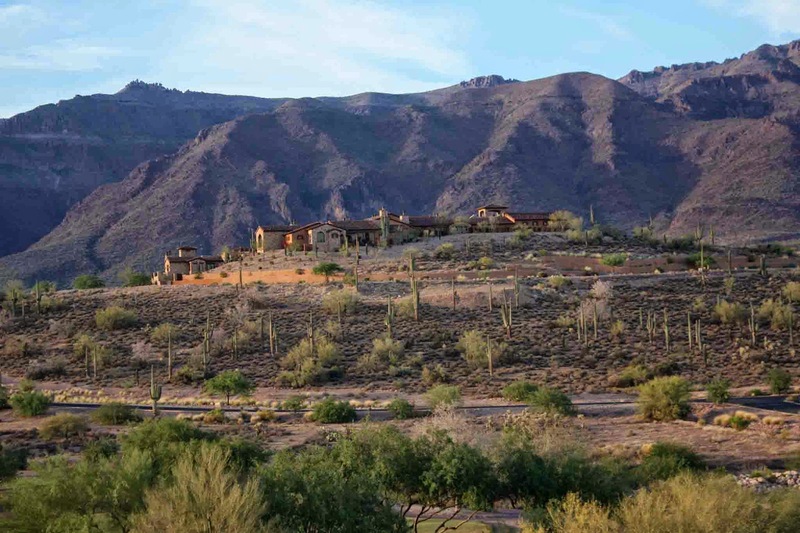 Towering views of the Superstition Mtns. The biggest improvement I saw was the clear trail easement, no scratchy bushes to constantly deal with. The trail was still a challenge, but this time a good challenge. It tests your technical riding ability, but nothing extreme. Roughly 2 miles later I reached the point where the trail turns abruptly down the slope. 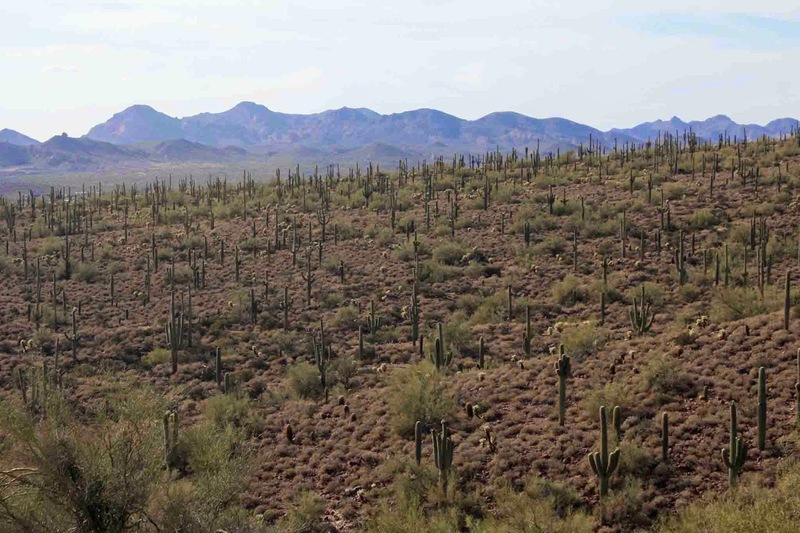 This section is rough, like riding on softballs. 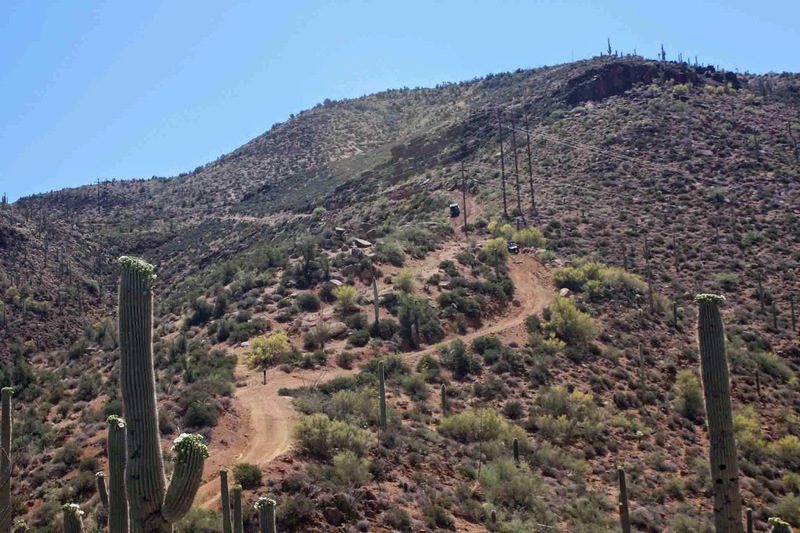 The good news, it IS rideable since it's downhill and only 1/2 a mile long. There are only a handful of times I long for a full squish bike, this is one of those times. 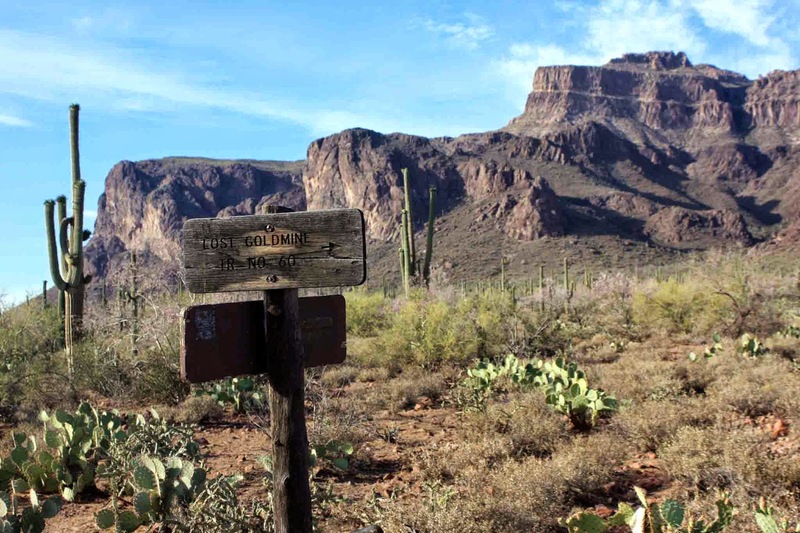 Junction of the Jacob Crosscut & W. Lost Goldmine trails. Down at the W. Lost Goldmine junction you have a choice, go right and exit at Broadway Ave about a 1/2 mile to the west or head east into Gold Canyon. The trail pointing east in tantalizing, enviting, but be warned it's chock full of techy goodness!! I felt really good on this ride and only dabbed a handful of times, momentum is key on this trail. This sign is not in the correct location!! The Wilderness boundary is 300' to the right & not on the trail!! 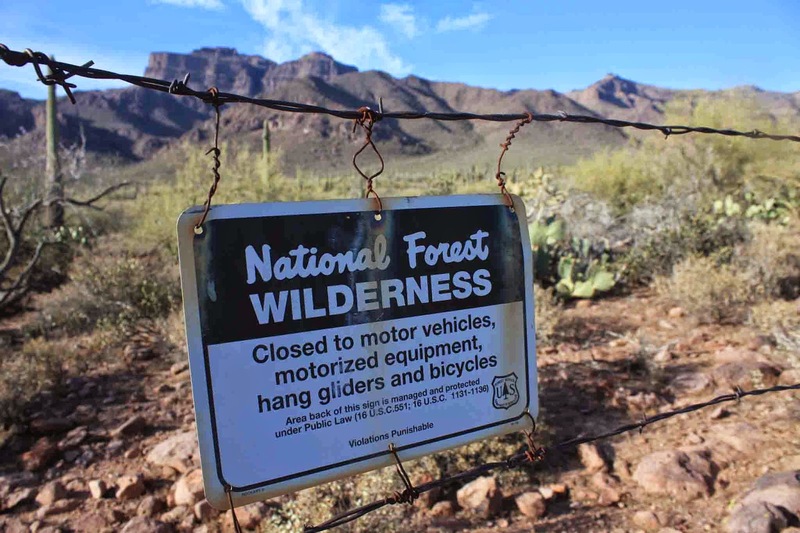 It should be a sign stating entrance to the Tonto National Forest. Almost a mile of this with some smooth sections tossed in. 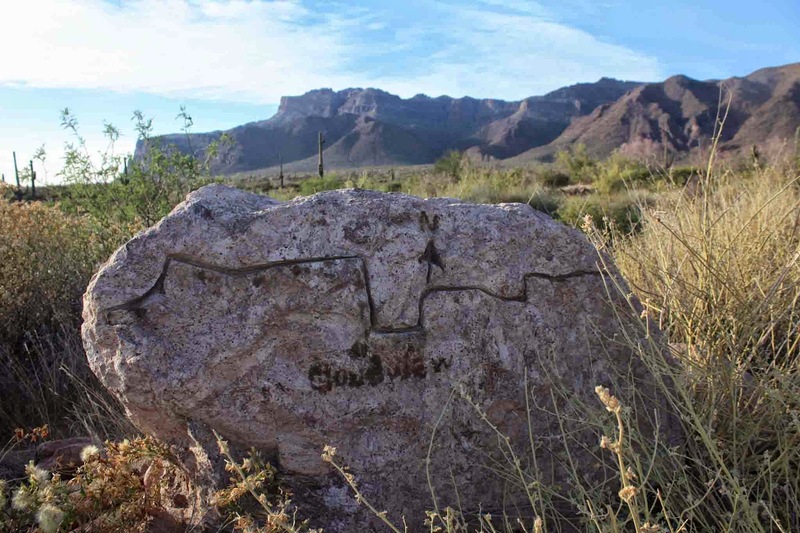 W. Lost Goldmine ends here, on Cloudview rd, this cool trail marker shows the entire length of the Lost Goldmine trail. This marker is located at the bottom of the vertical line on the map. As soon as I reached Cloudview rd I had my mind made up with regards to Jacob Crosscut & W. Lost Goldmine, they would be added to future long distance routes. 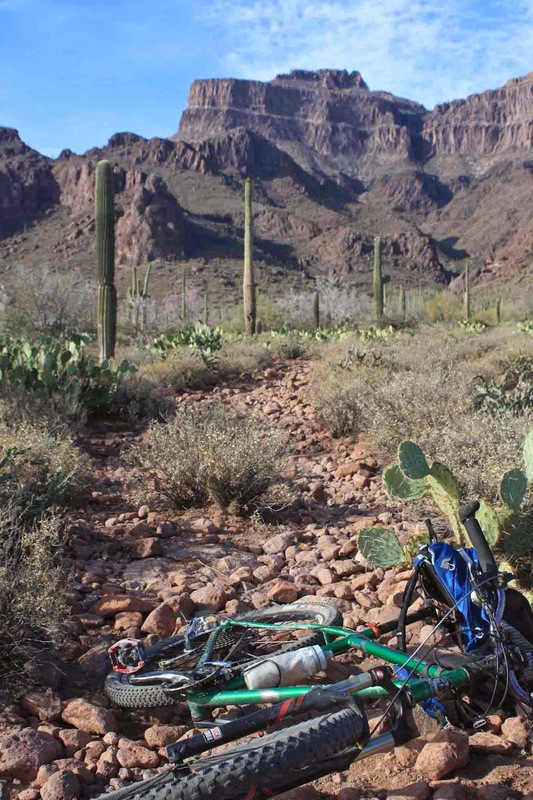 I'd keep both in for the East Valley Traverse, but I'd bail to Broadway Ave for my bikepacking loop in favor of re-supply options in Gold Canyon. 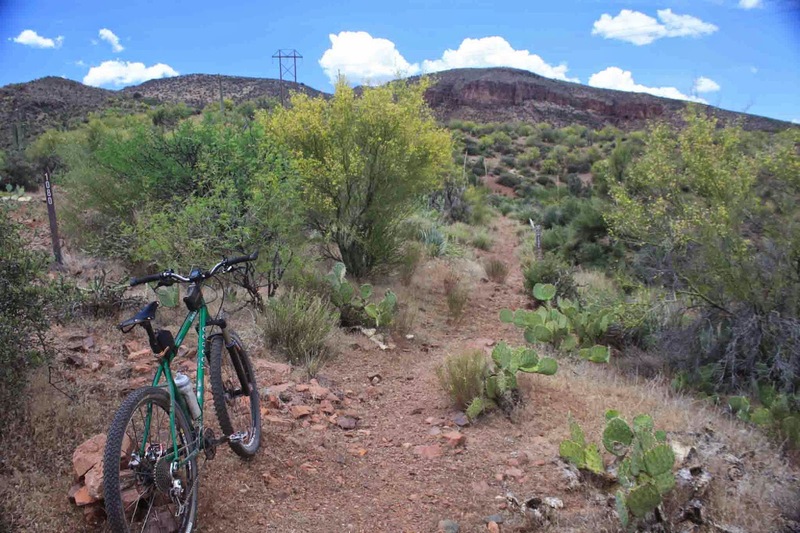 I finished this loop off by riding the connector singletrack in the Gold Canyon trail system down to the Apacheland entrance then cut through the neighborhood on Golden Rim / Don Donnelly tr. and down to De La Cruz. Nice pad with a view! !